The wet sand cannot be sold directly, It need dewatered at first. 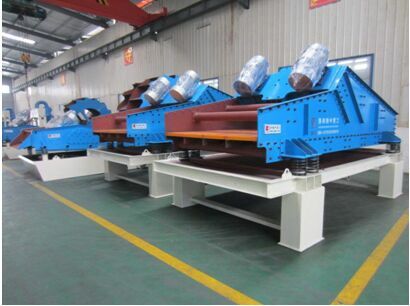 The main parts: PU screen, vibrating motors, sieve box, support system(rubber spring) etc. Usage: dewatering, granding, desliming etc. It adopts dual-motor self-synchronization technology, amplitude is adjustable. The dewatering screen has the vibration motor with the same performance parameters as excitation source, when two sets of vibration motor in the same angular velocity do reverse operation, the inertial force produced by an eccentric block in a particular aspect to repeated stack or offset, so as to produce a great shock, driving the screen box along the straight line track to do periodic reciprocating motion, make the materials on screen mesh from input to output to do gradually vibrate, during the vibrating process the part less than the screen hole water through the sieve hole falls, the rest material from the output falls, so as to achieve the purpose of grading and dewatering.